Background Evidence on the utility of ambulatory BP monitoring for risk prediction has been scarce and inconclusive in patients on hemodialysis. In addition, in cardiac diseases such as heart failure and atrial fibrillation (common among patients on hemodialysis), studies have found that parameters such as systolic BP (SBP) and pulse pressure (PP) have inverse or nonlinear (U-shaped) associations with mortality. Methods In total, 344 patients on hemodialysis (105 with atrial fibrillation, heart failure, or both) underwent ambulatory BP monitoring for 24 hours, starting before a dialysis session. The primary end point was all-cause mortality; the prespecified secondary end point was cardiovascular mortality. We performed linear and nonlinear Cox regression analyses for risk prediction to determine the associations between BP and study end points. Results During the mean 37.6-month follow-up, 115 patients died (47 from a cardiovascular cause). SBP and PP showed a U-shaped association with all-cause and cardiovascular mortality in the cohort. 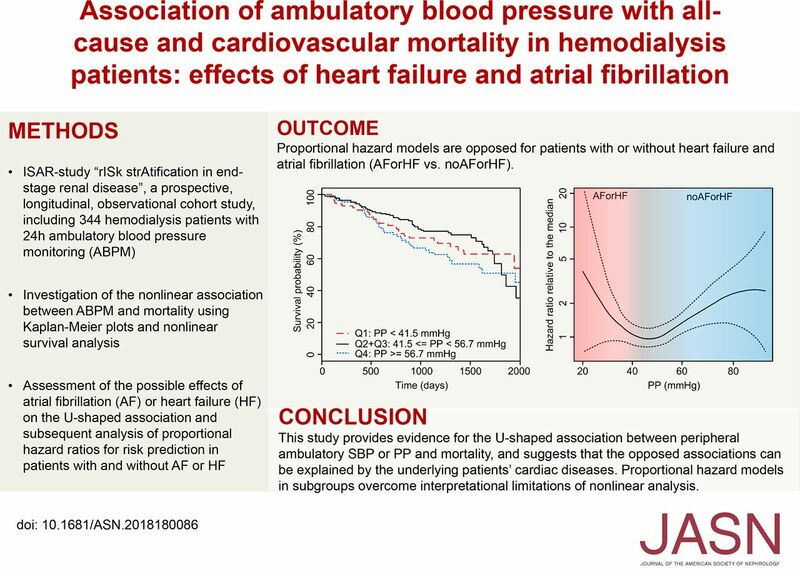 In linear subgroup analysis, SBP and PP were independent risk predictors and showed a significant inverse relationship to all-cause and cardiovascular mortality in patients with atrial fibrillation or heart failure. In patients without these conditions, these associations were in the opposite direction. SBP and PP were significant independent risk predictors for cardiovascular mortality; PP was a significant independent risk predictor for all-cause mortality. Conclusions This study provides evidence for the U-shaped association between peripheral ambulatory SBP or PP and mortality in patients on hemodialysis. Furthermore, it suggests that underlying cardiac disease can explain the opposite direction of associations.